Corbin Melvin catches a pass from Ben Mathews for a first down this past Saturday, Sept. 23, 2017, against Meadowdale for the Miami Trace 6th grade Black squad. 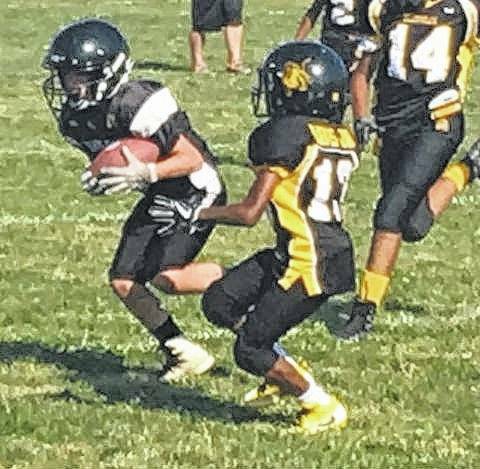 Teams in the Miami Trace Youth Football Program played their fourth week of the season games Saturday, Sept. 23. The third grade White team lost to Wilmington, 13-0. The fourth grade White team shut out Miamisburg, 33-0. The fourth grade Black team beat Wilmington, 20-6. The fifth grade Black team fell to Jamestown, 33-0. The fifth grade White team lost to Springboro, 33-0. The sixth grade White team lost its game to Wilmington, 22-0 and the sixth grade Black team lost to Meadowdale, 27-0.